Home / Blog / IT Staffing / Is It Worth to Hire Developers in Italy or in Ukraine? At the moment, the political and economic situation in Europe can not be called stable. After the British government decided to abandon membership in the European Union, this relay race was adopted by France and Italy. Although the situation in France has not reached a critical point yet, Italy is a significant problem for Europe already, as reported by Bloomberg View. The Five Star Movement intends to hold a referendum on the country’s membership in the European Union and has a high level of support among the population. Against the background of these events, the political and economic situation in Italy continues to deteriorate. This trend has a significant impact on the Information and communication technology (ICT) sector. At the moment, 75,000 companies operate in this sphere, but only the large companies invest in IT, according to Atradius. Small and medium-sized enterprises in this country do not receive sufficient investment and have virtually no credit facilities. All these tendencies negatively affect the promotion of ICT business in Italy that accounts for only 1.6% of the economy. As it is stated by Atradius, late payment of domestic invoices is on the highest level in Italy compared with other countries of Western Europe. The problem of late payment forces business owners to look for new solutions to protect their business. Thus, according to the same source, most entrepreneurs choose to check credit risk and creditworthiness of buyers as the main means to avoid late payments. The influence of Brexit on Ukrainian economy is not obvious and the forecasts are completely different. Some experts believe that the withdrawal of the UK will negatively affect the relations between Ukraine and Europe. Still, there is another opinion, according to which Europe will be willing to compensate for territorial losses and in this case Ukraine has a chance to become a European state. As for the Ukrainian IT sector, here we can observe a completely different situation than in Italy. The Ukrainian ICT is primarily famous for its human resources and IT talents, which makes the country the center of European outsourcing. Moreover, foreign economic legislation of Ukraine has been improved, which positively affected the number of investments in Ukrainian startups and the volume of provided outsourcing/offshoring services. This amount was $132 million in 2015 and this number is expected to be growing, according to Business Views. In light of the above trends, Italian companies are forced to resort to other ways of optimizing their businesses, for example outsourcing and offshoring. Outsourcing refers to the delegation of non-core transactions to an external structure that specializes in the management of exactly such jobs. In our case, it is ordering full-cycle web development. Offshoring is somewhat similar to outsourcing: it is an option in which part of the company’s production activities, for example, software development or dedicated development teams, are located in another country. Companies usually resort to outsourcing or offshoring for several reasons. For example, it may be a goal to reduce expenses and costs, increase focus on key competencies, use their labor and other resources more effectively, extend the team within the short time. It will be also interesting to compare the trends in outsourcing/offshoring in Ukraine and Italy. As it was reported by Getting the Deal Through, business process outsourcing for IT companies is rather popular in Italy. The overall volume of these services constitute 5% of European outsourcing market. It is also stated that 46% of companies apply to offshore IT services. As for Ukraine, it is one of the main countries providing team outstaffing services in Europe according to IT Outsourcing News. 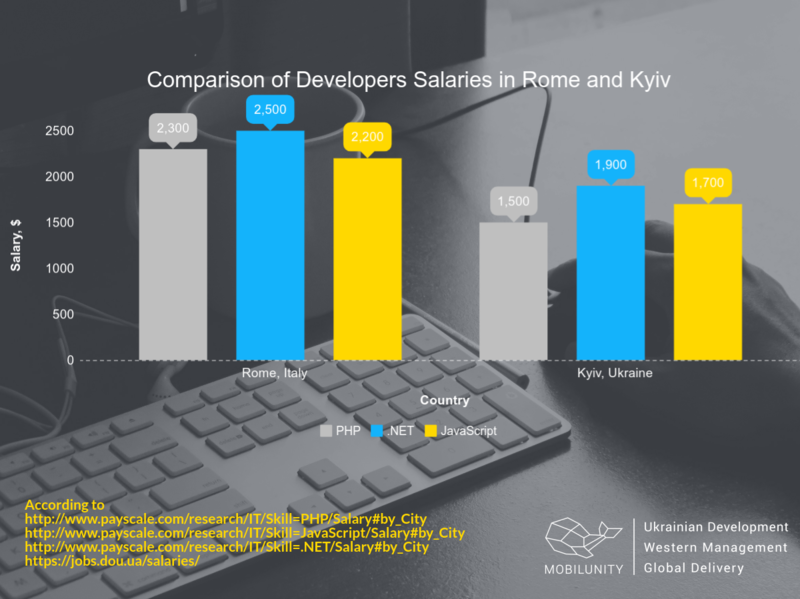 There are some reasons that help Ukraine be the leader and it proves why so many European businesses hire developers in Ukraine. These are: simplification of the business environment, flexible conditions for taxation, and reasonable price for hiring developers and development teams compared with other European countries. Hire Developers in Italy: How Much Does It Cost? Here are the indicators of wages of developers for hire Milan. A PHP developer salary is near $2,300. A .Net developer, in his/her turn, is able to get $2,500 per month. These indicators are shown on the appropriate graph. Hiring dedicated team Catania will cost you almost the same money. A PHP developer, for instance, should be paid $1,300 per month. It is possible to conclude that a member of dedicated team Italy is able to receive $2,700 per month, while the indicator of Ukrainian specialists is near $2,400. 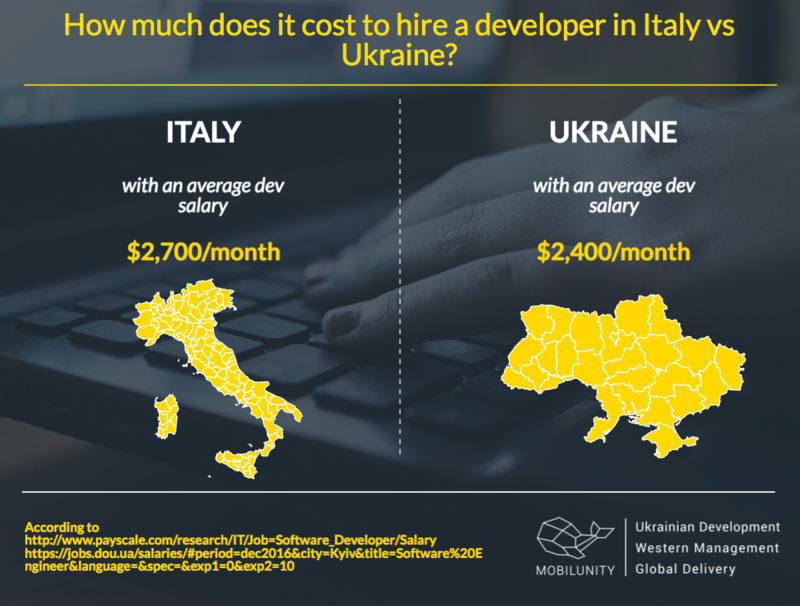 As you can see from the stats provided above, dedicated team in Italy and Ukraine will cost approximately the same, still Ukrainian developers cost less and thus, you can save quite much if you need programmers for long-term projects. Moreover, according to IT outsourcing trends (2017), Ukrainian developers will direct their efforts to develop integrated cloud platforms, robotics solutions, and innovations in data protection this year. These means that considering pros and cons of hiring dedicated development teams, it is necessary to come from the peculiarities of your project first of all. If you need devs skilled in cloud computing and data protection, the choice is obvious. There is one more reason of hiring Ukrainian programmers with the help of offshore IT services provider. Our developers have a significant experience in dealing with foreign customers and Italian ones are not an exception. Cooperating with our coders you will be sure that they have no barriers, so a language, timezone and other reasons are not an obstacle to our productive work. 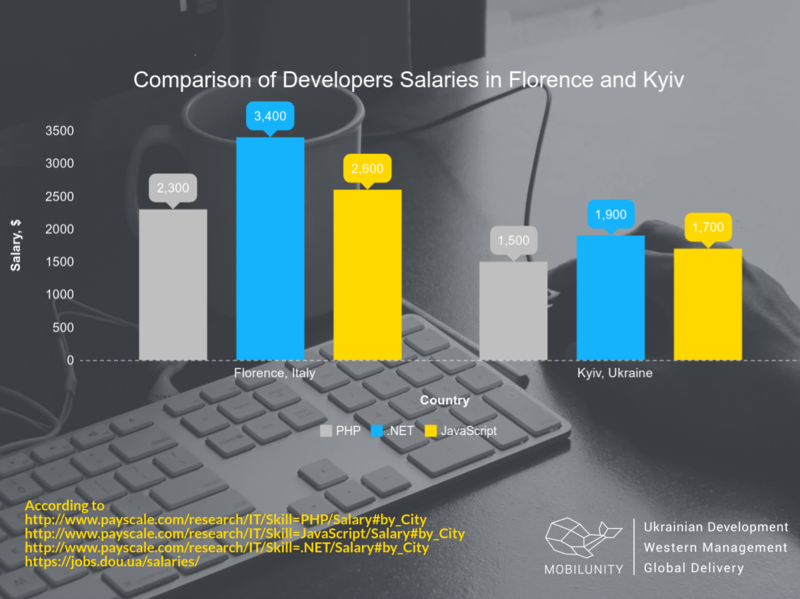 Hire Developers in Italy or find more affordable ones in Ukraine!